Witch Hunt was recorded in an industrial garage in Williamsburg, Brooklyn. It features Smitty's electric and acoustic playing in a raw context. Due to the adverse conditions under which it was recorded, there's a provocative and personal quality hard to access in many of today's more modern recording environments. 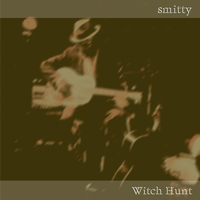 Witch Hunt demonstrates Smitty's ability to fuse Chicago Blues, Jazz and early Rock 'n' Roll to create a new and unique style.